Director/Screenplay – Jon Schnepp, Producers – Holly Pane & Jon Schnepp, Photography – Carl King, Music – Frederick William Scott. Production Company – Scheppzone Inc./Super Skull Ship Inc. The Death of “Superman Lives”: What Happened? 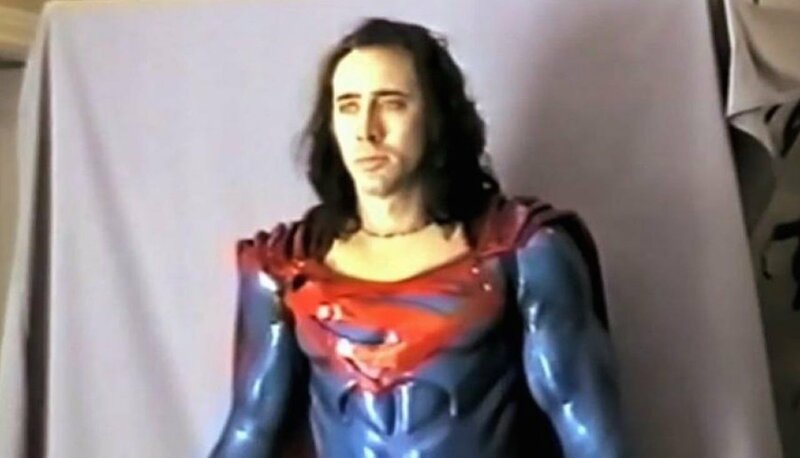 is a documentary about the making of Tm Burton’s planned Superman Lives film project that would have starred Nicolas Cage as Superman. This went into pre-production around 1996-7 for a projected 1998 release but was cancelled before it ever went to camera. Following the habit of failed and aborted projects being resurrected for documentary examination as has happened in recent years with the success of the likes of Lost in La Mancha (2002), Jodorowsky’s Dune (2013), Lost Soul: The Doomed Journey of Richard Stanley’s Island of Dr. Moreau (2014) and Doomed: The Untold Story of Roger Corman’s The Fantastic Four (2015), Superman Lives gets its turn here. The Death of “Superman Lives”: What Happened? comes from Jon Schnepp who has had a career working mostly as an animation director on various shows including The Venture Brothers (2003– ) and Metalocalypse (2013– ) and in live-action with the W is for WTF episode of The ABCs of Death (2012). Schnepp became a commentator on AMC Movie Talk, a film news channel on YouTube for the AMC movie chain and later moved over to do similar things for www.collider.com. Schnepp raised the funding for The Death of “Superman Lives” via a Kickstarter campaign. It would be his last film work before his death in 2018 of a stroke at the age of 51. You have to commend Schnepp as he does an extremely thorough job of covering the production, managing to get interview time with Tim Burton, producer Jon Peters, studio head Lorenzo di Bonaventura, all of the various scriptwriters and a good many of the people involved in the conceptual artwork, costuming and special effects. About the only person noticeably not interviewed is Nicolas Cage, which is a little disappointing in that you cannot help but think that hearing his take on interpreting Superman would have been fascinating. The pre-credits scene takes place at a convention where Schnepp gets various fans to try and parse the credibility gap that most audiences of the 1990s had with the idea of Nicolas Cage cast as Superman. Schnepp even raises the claim the Bryan Singer purportedly kept a copy of photo of Cage in costume with him during the shooting of Superman Returns (2006) to show people exactly what he didn’t want his version to become. At contrast to this, Schnepp then spends nearly half the documentary making the case for the costume designs. He even manages to obtain several minutes worth of the test footage of Nicolas Cage trying out the costumes and dressing up as a bespectacled and pastel-suited Clark Kent (where both he and Tim Burton are seen discussing how they wanted Clark to be someone even freakier than Superman and joke about giving him a Mickey Mouse t-shirt). In the film’s defence, Schnepp points out that the negative reactions to Cage in costume only come from a single still taken from the costume test fitting, not from the actual set itself, and where nothing had been finalised. Moreover, he also reminds us that the much disparaged idea of a long-haired Superman was something that was in vogue in the DC comic-books throughout the 1990s. Certainly, from the production sketches we get and the test footage of Steve Johnson and his crew building what they call the resurrection suit with embedded lights, some of this looks undeniably impressive. In comparison to a film like Lost in La Mancha or Lost Soul, the story of Superman Lives lacks the same mind-boggling fascination of watching a train wreck occurring – there is not the same stories about unbelievable on-set disasters and mishaps. The film’s torpedoing is nothing as dramatic as runaway actor egos, merely Warner Brothers getting nervous about the financial outlay and pulling the plug because they considered it too expensive. At most, what the film shows are a set of competing forces on the production – usually between Jon Peters and everybody else. Kevin Smith relays in the garrulous and highly entertaining way he does the story of his involvement and the random requests from Peters – that this Superman have no costume, that Superman does not fly and his oft-told anecdote that the film features a giant spider. (Peters denies all but the giant spider). The more Schnepp talks to people the more you get the sense of Peters as someone who would have wild, out of the blue ideas and demanded they be shoehorned onto the production, no matter whether they fit with the Superman mythos or not – the aforementioned giant spider, the idea of Brainiac having to fight polar bears on his way to the Fortress of Solitude, Brainiac flying in a spaceship shaped like a skull (which was eventually built as a model that looks more striking than it sounds) or Superman battling ninjas. Certainly, some of the actors touted in the familiar roles sound fascinating – Sandra Bullock as Lois Lane (which actually makes for perfect casting when you think about it), Christopher Walken as Brainiac and Kevin Spacey as Lex Luthor (a decade before Spacey was cast in the very same role in Superman Returns). If nothing else, there is a certain train wreck aspect to watching the various personalities. 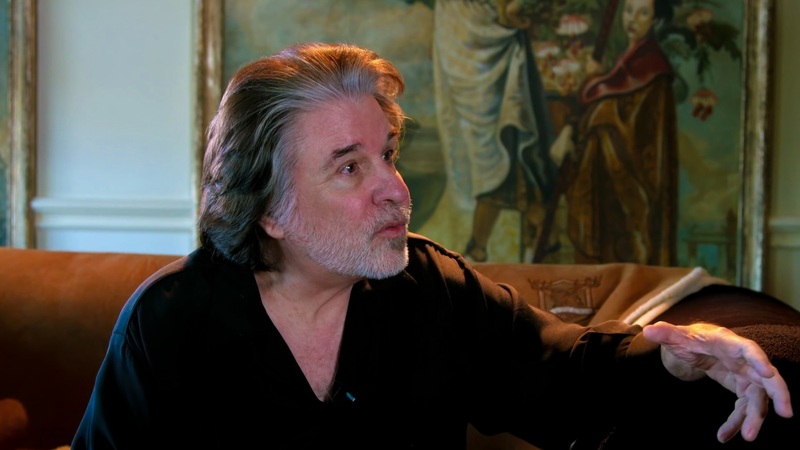 Jon Peters comes across as a bizarre figure. His past as a hairdresser and entry into the industry as Barbra Streisand’s boyfriend is brought up and he freely admits it, but at contrast to the sort of cliche figure you might associate with being hairdresser, Peters also candidly admits he has been in hundreds of street fights. Some of the stories about him that emerge sound fascinatingly bizarre – that he took his kids along with him to get their input into the design sketches or that he put one of the production artists in a headlock. (Peters denies none of these, claiming in his defence he wanted to show the artist he headlocked the physicality of what a fight looked like). There is also Tim Burton. Now, I used to have a great deal of respect for Burton’s abilities as a director up at least up until around the year 2000 – after which his work seems to have tumbled into stale repetition – but I have seen very little of him in interviews. I was kind of taken aback by the Burton we see here who spends the entire interview behind a pair of dark glasses (in a heavily shaded room). Interviewed, he seems vague about everything, starts sentences and seems to wander off topic before he gets to the end of them and offers astonishingly little in the way of insight into the entire debacle of any of the people interviewed (even though almost none of the problems are heaped at his door). He presents the sort of presence you might imagine of someone heavily medicated or suffering from premature Alzheimer’s, not someone who has been claimed a creative genius. (Although it is entirely possible that this might well explain Burton’s slump in the 2000s/10s). I have little doubt that Tim Burton would have pulled off a fascinating, even possibly very good Superman film – he after all did make what in my mind are the two best Batman films, Batman (1989) and Batman Returns (1992). On the other hand, my suspicion would have been that we would have had a Superman film that was an interesting curiosity but hated by the fans of the comic-book. With the exception of the fanboy Kevin Smith, whose script was tossed out by Burton the moment he signed on, all of the other scriptwriters appeared to have varied widely from DC canon. (Mindedly, this is also something that all the Christopher Reeve films are guilty of). To varying degrees, the different scripts were drawn from The Death of Superman (1992-3), DC’s biggest selling Superman title of the 1990s. Burton’s interpretation was one where Superman was the eternal outsider, which is not really a take that seems the most evident one to me when I sit down and read Superman comics (although is one that you perpetually associate with Burton’s films). Another version of the script had Superman growing up ignorant of his origin as a Kryptonian. One of the more egregious additions was that Superman would be accompanied by a companion called K, which appears to have been everything from his cape, which would take on a life of its own, or in other versions something like an android pet/mentor that eventually merged and became his suit. Or even Burton’s idea of a dark Superman and his final re-emergence in a black Superman suit at the end – where clearly he and Peters were trying to readapt Superman into the Dark Knight mythos that they had done so well with the Batman films.